What payment options are available? For your convenience we accept cash, checks, money orders, and direct payments through an ACH bank draft. The ACH Bank Draft information is available on our forms page. You can mail in your payment, pay your account in person, or drop your payment into the payment box located outside of our office gate. Prepayment or advanced payments of accounts are also accepted. We now accept all major credit cards. Why am I not receiving a bill? You are responsible with providing accurate information regarding mailing addresses and phone numbers. Contact our office to make sure the information we have on file is correct. What should I do if I am leaving the home for a period of time? FCWAI recommends you shut off the water at the shut-off valve by the meter and turn off the hot water heater before you leave even if only for a few days. This could save you a great deal of expense if you had a leak and it flooded your home. If you are leaving for an extended period of time, contact our office so that we may know where to bill your account and how to contact you if there is a problem. When do you bill and when is it due? We bill out monthly usually by the 15th of the month. Bills are due on the 5th of the following month. Late bills are mailed out after the 5th and all past due amounts must be paid immediately or the account could be subject to Lock Off. Do I have to pay when I do not use any water? Yes. There is a minimum charge each month. This charge is for the availability of water, and is designed to cover the underlying cost of the facilities. What should I do if my water bill seems incorrect? If you suspect your water reading or usage is incorrect, contact our office immediately after you receive your bill. If adjustments are to be made to any account, they must be done during the current month’s billing cycle. How do I read my meter? Just like a car’s odometer, the meter records how many gallons passed through the meter. And like an odometer, a water meter is never reset. FCWAI bills in hundreds of gallons so the last two numbers are not used when calculating your monthly usage. The large red needle reads gallons and one complete revolution equals 10 gallons. The small triangle is a leak detector and should not be moving when there is no water being used inside or outside your home or business. 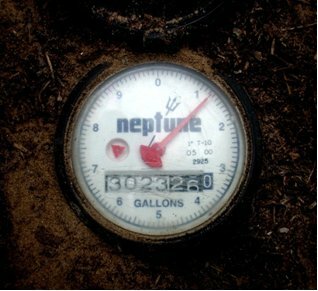 The meter shown above reads 3,023,261 gallons. To find out how much water you have used, subtract the number identified on your bill as “Current” from the current reading on your meter. Using the meter above for example: If your “Current” number on a bill is 3021300 and we subtract it from the above reading, we find that 1900 gallons have been used. Poorly adjusted sprinkler systems that result in unnecessary irrigation. Often this is caused by power outages or sprinkler controllers that are not adjusted for changing conditions. Over irrigation on slopes or outlying landscaping due to missing sprinkler heads or broken pipes. Hose left on in yard or pool by mistake. Leaks from faucets or shower heads. A 1/16″ hole in a pipe may waste 24,000 gallons a month. 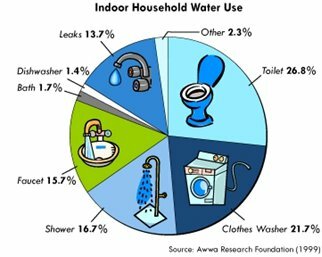 Cleaning or construction crews adding to normal water consumption. Extra House guests – kids home from college or extra family staying over. 5 gallons of water can be run to brush your teeth if you don’t turn off the tap. A household faucet can use 3-5 gallons each minute. A shower uses 5-10 gallons a minute. Taking a tub bath can use up to 40 gallons of water. Toilets use between 2 and 7 gallons per flush. Dishwashers average between 15 – 25 gallons per use. A full load of clothes uses 35 gallons of water typically. A dripping faucet can waste thousands of gallons per year. How do I shut-off my water? FCWAI maintains a shut off valve for members use located by the meter box. It is usually in a round box or pipe on the house side of the rectangular meter box. If you cannot locate your shut-off valve or if there is an emergency need to shut the water off at the water meter, call our office (day or night) to shut off the water at the meter. DO NOT turn off the valve inside the rectangular meter box or you will be subject to a tampering penalty and charged for any damage. Additionally, almost every home, apartment and business has a shut-off valve somewhere outside the building. In an emergency, it is important that you know where your shut-off valves are located. You do not want to be searching for a valve if the house is flooding or carpets are being soaked. The most likely location for this second shut-off valve is where the water supply line enters the building. It might also be near the water heater or clothes washer. Once you have found the shut-off valves, mark them with a tag or bright paint. Also, be sure it can be turned by hand. If not, keep a wrench nearby. How do I check for leaks? You are responsible for finding leaks on your property. You can check for leaks by looking at your water meter. Most of our meters have small triangles or bows that turn even with the smallest amount of usage. By looking at this indicator or by looking at the needle on the meter, you can perform a simple leak detection test with little effort. Try these simple steps. Shut off all running water inside and outside your home or business. Check the indicator or the meter’s needle. If it is moving, you have a leak. Close the valve on the side of your home or business where your inlet is. If the indicator or needle moves, your leak is either in your sprinkle system or in the line leading to your home or business. If the indicator or needle stops, the leak is inside. If the leak is inside, turn off each supply valve located by sinks and toilets separately and check the indicator or needle until it stops. The most common leak is a toilet flapper. To test the flapper, place a few drops of food coloring in the toilet tank, (not the bowl.) Let it set for 15 to 20 minutes without flushing and check the bowl for traces of food coloring. If the color can be seen in the bowl, the flapper needs to be replaced. A red flapper is more resistant to chlorine and is recommended. Remember to flush the toilet a few times after this test to prevent staining. Try to locate and repair leaks immediately to save time, money, and water. How much water can a leak waste? A tremendous amount of water costing hundreds of dollars can be wasted from what appears to be small leaks. We have seen as much as 30,000 gallons wasted in a single month just due to a toilet leak. This link has a drip/leak calculator. Drip Calculator. The key is to find leaks and fix them as quickly as possible. Leaks do not get better. They get worse. What do you treat the water with? FCWAI treats water with aeration, filtration, a corrosion inhibitor, and chlorine. All processed and chemicals are approved for drinking water. Is there Fluoride in FCWAI’s water? Approximately 0.12 parts per million (ppm) of naturally-occurring fluoride exist in the ground water used by FCWAI. No additional Fluoride is added. Is FCWAI’s water hard or soft? The hardness of water is referred to by three types of measurement: grains per gallon, milligrams per liter (mg/l), or parts per million (ppm). The water supplied by FCWAI has a hardness of approximately 195 mg/l or 11.4 grains per gallon. That amount of hardness makes FCWAI’s water hard. Please refer to our Water Softeners page for more information. What are the white spots on my glasses when they come out of the dishwater? Calcium. Recently, many states banned phosphates from dishwasher soap as it contributed to the pollution of lakes and streams. These phosphates kept the water from drying on the glasses and leaving hard water spots. There are many drying aids on the market that may help. To remove the white haze from your dishware, try soaking them in a sink full of water with a cup of white vinegar. Should I drink bottled water? Some customers may prefer to drink water that does not contain chlorine. Those customers may want to buy bottled water or install a simple home treatment device for these reasons. Customers who drink bottled water or water from a home treatment device should do so because they prefer the taste, not out of concern for the safety of water provided by FCWAI. Why does my water smell? Typically odors develop in hot water heaters that are not well maintained. It is recommended that hot water heaters are flushed annually to prevent odors and formation of debris that may clog aerators. Why do I sometimes get discolored water? If you have discolored water, call our office immediately. Usually this is caused by our quarterly flushing of all main lines as required by DEP. This discoloration is not hazardous and should be only temporary. If we are not flushing the area, it could mean there is a break in a water line in your area. Check the water supply valve normally located on your water service line. This valve may be broken or in a partially closed position that can restrict the normal flow of water. Check the pressure regulator if you have one. This is usually located on the water service line entering your home or business. If broken or improperly adjusted, your pressure will be affected. Not every property has a pressure regulator. Check all faucet screens and shower heads for build-up that could restrict the flow of water. Check plumbing valves under sinks and basins, making sure they are completely open. Check for other water leaks, both in the house and in outside irrigation systems that may cause low water pressure in the rest of your system. If checking these items does not solve the problem, contact the FCWAI office during normal business hours. I saw someone open a fire hydrant. Is that allowed? Only employees of the FCWAI and the Citrus County Fire Department can operate fire hydrants. Contact FCWAI or the sheriff’s office if you see a hydrant being operated by anyone but a fire fighter or a FCWAI employee. How do I get rid of the chlorine in my water? The easiest way for chlorine to be removed from drinking water is to allow it to set in an open container before use. An inexpensive charcoal device that can be mounted to a sink faucet will also remove all chlorine, but care must be taken to maintain these devices as per their instructions. What is the ‘pink slime’ or black mold that I sometimes find in my shower or toilet? Certain species of airborne bacteria gravitate towards and thrive in a moist environment, such as showerheads, sink drains, tiles, and dog dishes. These slimes and molds are naturally occurring and are generally harmless. The best way to avoid this problem is to keep these surfaces free from the bacterial film through regular and thorough cleaning utilizing Lysol or a chlorine-based product. Do I need contact you to dig in the right of way? You must dial 811 and notify before any construction or excavation or you will be responsible for any damages. How do I report a water main break or leak? All water main breaks are considered an emergency. If sighted call 726-3366 and report the condition. We will dispatch an employee to assess the situation. Dependent upon the severity, depth, size, weather, and other factors, the repair will be made as soon as possible.